I'm invading the SPCR forum. My financial situation leaves quite a bit to be desired and since my birthday and christmas are coming up I figured I'd take the opportunity to improve my computer a bit. It's really primarily a matter of trying to reduce the noise it makes, rather than make it a whole lot more powerful. After doing some reading and as direct help I got in a thread I created here on SPCR, I'm thinking of switching my current PSU (which has started to make quite a bit of noise) to a Seasonic G-450. But actually the noisiest part seems to be my graphics card (Asus Radeon HD 4850 HTDI 512MB), or rather the cooling system (Arctic Cooling Accelero Twin Turbo, as my signature says). A friend of mine said that I can actually get a new one without a fan altogether (you see my level of knowledge, hehe) for a modest sum of money. Looking at a couple of computer stores websites it seems to me that pretty much every card available is more powerful than the one I've got. ASUS GeForce GT 610 1024MB for example, is available cheaply. So is Asus Radeon HD6450 1024MB Silent. I really don't do much in the way of gaming. I surf the internet, watch the occasional movie (I do watch online streams on occasion, is that relevant?) and do pretty regular stuff, I guess. Would any of the two graphics cards mentioned above work for me, given my needs, and the computer I have? Do the work with my motherboard for instance? And they wouldn't be too much for a Seasonic G-450 (450W) to handle, no? Is there anything else to consider? Or any other suggestions? When I check out the review section here on SPCR, most of the cards there actually seem to be more powerful than I need, as far as I can tell. The G450 PSU should be more than enough for any non-gaming GPU + "normal" computer. I think it should be enough even for your 4850 GPU. The GPU card with the smallest power consumption (and cheapest!) is the 5450: I have two of them, both fanless. Do not buy the Sapphire 5450, its heatsink is kept in place with really weak pushpings (the same for the Sapphire 6450). The Asus one is good, though: I can recommend it. All these GPUs are going to be much slower than your 4850, so if you are going to play some games make sure they will be fast enough for those games: the 6450 will be a bit faster than the 5450, but not much. I play some *old* games, and my 5450 is enough, but be careful. Techpowerup is a good source for game performance info as well as power consumption and noise. For video my 5450s are more than enough. I'm surprised, I figured my card was substantially less powerful than the ones I mentioned above. But you're saying that's not the case? A dumb question, but how do I see that? I mean one is even of the same brand, and the numbers are bigger (Asus Radeon HD 6450 1024MB Silent), twice the memory and the model name 6450 suggests (well, I thought at least) a more powerful card than my 4850. I've clearly got a hell of a lot of learning to do, but at least I'm on my way. If you don't play a lot of games and the only problem with your current graphics card is the noise you could try to make it less noisy instead of buying a new card. Slow down the fans or even remove them. Idle temps should be ok without the fans, and depending on case ventilation you might even be fine while gaming. TDP for the HD 4850 is 110W I think. Removing the fans and replace with a slower more quiet 120mm fan (zip-tied to the heatsink) is another option. There is no hard and fast rule to know which card is faster just by looking at the model/name or amount of RAM, the only way to really know is to check in sites such as techpowerup, and compare the models you are interested in. It is key that you check the games you use. Techpowerup seems to really care about GPU noise, that's why I tend to take a look at it when it comes to GPUs. For performance comparison Google is your friend: you might want to search for "6450 vs 4500 ATI", "5450 vs 6450" and the like for getting hard data. If you don't play a lot of games and the only problem with your current graphics card is the noise you could try to make it less noisy instead of buying a new card. Slow down the fans or even remove them. Idle temps should be ok without the fans, and depending on case ventilation you might even be fine while gaming. TDP for the HD 4850 is 110W I think. Removing the fans and replace with a slower more quiet 120mm fan is another option. Removing fans in a 4850 could end up in a disaster, I would not even consider that. And using a big slow fan without a good heatsink (think of Accelero S1) can be dangerous, and even if the GPU temperature were ok, VRMs might get too hot. Maybe he can change the fan speed as you suggest, so that the fans do not run that fast when temps are low. That might help to make noise bearable while not gaming. Besides, he might try underclocking and undervolting the card, so that it generates less heat and the fans do not need to run so fast -if he finds performance is good enough. Quite a bit of helpful information, thanks guys. Is it Arctic Accelero S1 Plus or Arctic Accelero S1 Rev. 2 you mentioned? Is it difficult to install? If it's simple enough for me to be able to do it, maybe it would be an alternative since, it seems, my current video card is significantly better than the passive ones I'm considering. Assuming I can even get a hold of one, that is. I'm suprised that the aftermarker cooler is loud. Try using the Catalyst Contol Center to modify the fan speed. When you right click on an empty spot on your monitor, it should show up as the top option. Click, Performance/AMD OverDrive tab. Enable manual fan control. Monitor the temps to make sure the GPU stays at a realistic temp. Heck, if you don't game, you could underclock the card here, too. What temperatures should I try not to exceed? Right now it seems there's three sensors on the video card (acourding to the app I use, at least) and they range between 55°C and 65°C (roughly 130°F and 150°F). The point of underclocking is to make possible even slower fan speeds and thereby redusing noise even further, right? Are there any possible risks in doing so? *edit* Um, not entirely sure what to make of this but when I enter AMD Overdrive it only shows one temperature, and it's 55°C (roughly 130°F, I guess). The fan speed is set at 59%. Interesting number, nice and even. Oh, by the way, how does the grapchics cooling system work right now, being automatic? Will the computer automatically adjust the fan speed depending on the "strain" (and by extension temperatur) you put on the card? And when I temper with it it will have a certain fixed speed? I just want to know so since I guess it means I have to be a little cautious, if that's the case. Here's my 5770's profile idle and gaming. You can see the CPU clock idles at 400 and games at 850MHz. With CCC you can only adjust the speed of the clocks when it's in "performance mode" aka gaming or other 3D task. So, don't worry about that at the moment...there are other tools...but first thing first. See the check box for manual fan control? Check it. Then, move it to a lower rpm and run what ever apps you usually run. Keep an eye on the GPU temp. As long as it's under 80-85C it's ok. Fiddle with it until you like it. Chances are, if you can get the fan speeds down in the 30% range, it'll be way quieter than it is now. Um, so literally nothing happens when I try to change the speed in Catalyst Control Center. I've probably messed up somehow. I've got a fan controller to which I've connected the 2 CPU fans, the 3 case fans and lastly my gfx cooler fan too. However, whereas everything works as it should with the other ones, as for the gfx cooler fan I can't control it via the fan controller. It still runs though. So maybe that has something to do with it? I'm thinking I either should connect it somewhere else, the motherboard? Or shouldn't it be possible to manage it via the fan controller, like the rest? In case nothing works, are there any other good after market gfx coolers? Last edited by kakua on Sat Nov 30, 2013 1:30 am, edited 3 times in total. You already have a good cooler for the graphics card. No need to spend money on a new one. Find a way to slow down the fans. What kind of fan controller are you using? Running passive is risky, yes. But less insane than getting a new card when a HD 4850 with an Arctic Cooling Accelero Twin Turbo should be quiet enough. I added the fan controller to my signature. Its' called Zalman ZM-MFC1-Plus. That should give you manual control of the fans (5-11 volts). Are you saying that the controller has no effect? The fans spins at constant speed no matter how you turn the knob? edit: Saw your edited post now. Yeah, at full speed the fans will be noisy. The gfx cooler cable is connected to a contact on which it says 7V. There's one where it says 12V too, but that makes it spin even faster (which is no doubt obvious to you guys). But for the 7V contact, yeah, I suppose it does run at full speed. And I am curious about how much I can reduce the noise by slowing down the speed of the fan, particularly in combination with under clocking the video card as CA_Steve suggested above. I still haven't figure out how to actually do it, though. I'm not sure that I was able to make it clear above (my english isn't the best), but the cable from gfx cooler isn't (at first I thought it was, but when I checked I saw that I was wrong) connected to one of the "knobs" on the fan controller. Rather it's connected to a power cable (is that the word?) from the PSU, which, splits into two, of which one end goes to the fan controller providing it with electricity and the other end provides the gfx cooler with electricity. Well, at least I think so. The gfx cooler cable is connected to a contact on which it says 7V. There's one where it says 12V too, but that makes it spin even faster (which is no doubt obvious to you guys). If that's the case, you can't control the fan speed: the voltage it receives is fixed and can't be changed to change the fan speed. 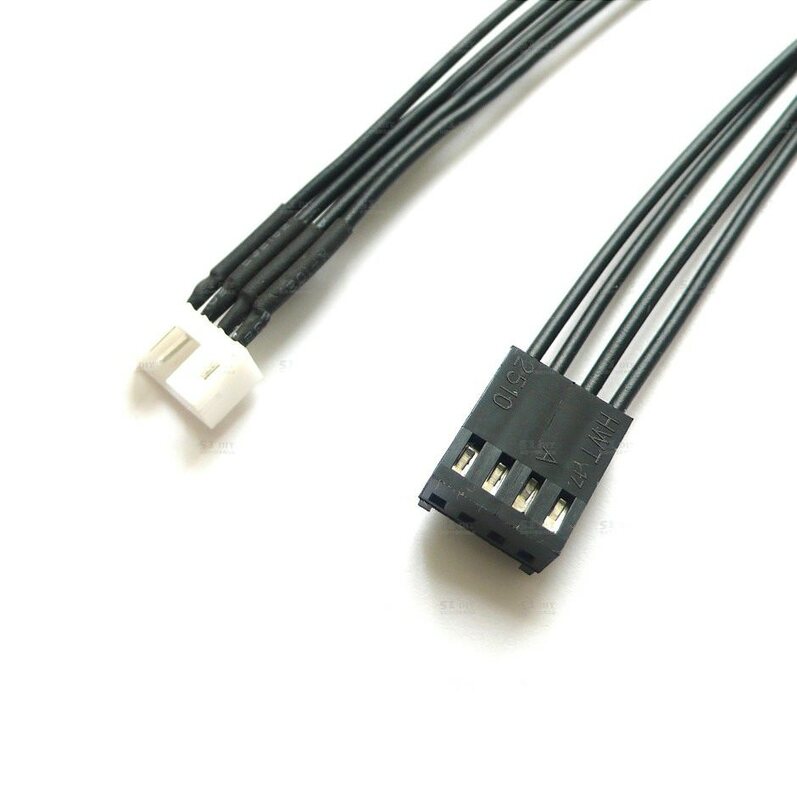 To control the fan speed with CCC or any other tool, you need the cooler fan to be connected to the fan power connector in your graphics card -both must have the same connector type, else you will be out of luck. Then it might be possible to control the fan speed. *edit* Okay, so I managed to get the pictures to work. Apologies for them being so bloody large. Is there a spoiler function on the forum, so I can hide them, and anyone who wishes to see them can simply click on the Spoiler button? It would be really disappointing if I'm not able to control the cooler fan either through the fan controller or an application. Isn't there some way to get it to fit into either of the two? Thanks, the pictures helps. To bad the fan connector isn't the normal 3 pin type. Now it gets complicated unless you know how to wield the soldering iron. Either you need to replace the connector, or replace the fans. If you have a 120mm fan lying around you could use that. Remove the whole plastic shell with the two fans and zip tie the 120mm fan to the heatsink. Or you could keep the two fans and change the connector into something we can use. Either the connector from the original cooler if you still have it, or a connector from an old chassis fan. An adapter would solve this, but I'm not sure one exists. Maybe you could check on eBay, lots of adapters there, but no telling if they will work. I also wasn't able to control my Arctic Accelero Extreme III on GTX780, and its a wide known problem, that affected all users that did this Arctic Cooling Accelero Extreme III installation on GTX780. Im also using it on PSU 7V adapter. Now if you want to use it with your external fan controller you just need an adapter, something like Mini 4-Pin GPU to 4-Pin Fan Adapter should do the trick (crosscheck is the same 4 pin), it will convert the 4pin GPU of the arctic fans into a 4pin standard fan header, that you should be able to connect to your fan controller. So there's no adapter to fit the cooler fan cable to the video card (which is the way it's usually done), but there is one to connect it to the fan controller, did I get that right? Is any of the two preferable? Assuming I can lower the speed significantly with the fan controller, it seems to be the more practical choice to me, given how easy it is. But I may well be missing something here. Um, are you sure you got the adapter right? I think my Nexus Real Silent 120's use 3 pin connectors. The contacts on the fan controller are 3 pin too. But there are both a 3 pin and a 4 pin connector on the cable from the gfx cooler fan. *edit* After reading the thread Abula linked to I'll try to answer my own question above. The advantage with having the cooler fan connected to the video card rather than to the fan controller is that it's run automatically based on the temperature of the video card, yes? So it speeds up when you, say, play a computer game and slows down when you surf the internet. And if you still think it runs unneccesarily fast then you can adjust that too, in for instance Catalyst Control Center, as CA_Steve described above. Also, I opened the case again and looked at my case fans, my CPU fans and the fan controller, and unless I completely misunderstand what 3 and 4 pin connectors are they're all 3 pin. 3 cables that runs into a connector with three holes/pins. kakua im not completly sure what you want to do or what you have tried. In my case i couldnt control the fans on the Arctic Extreme III, at first i though was Arctic fault into being defective or not compatible with the GTX780, then i bought a very similar connector to the one that Prolimatech MK-26 comes with, i wanted to test other fans to see if it was Arctic or Nvidia design, Mini 4-Pin GPU to 2 x 4-Pin FWM Fan Adapter, with it i tried Scythe KamaFlex2 PWM, Noctua NF-A14 and A15 PWM, Thermalright TY140 PWM, and in here was worst the fans ran at full 12V and i had no control on them with MSI afterburner and EVGA Precision, so i deternimed it was Nvidia design into how they manage the PWM fans and not really arctic fault (although i still have my doubts). Now what you need to stablish is weather you can control PWM fan or not with the AMD/Ati utility, if you can you can buy the above adapter and run standard 120mm PWM fans to it (not 3pin), there are even cleaver ways to mount the fans if you have space for example PCI 12cm Dual Fans Mount Rack Cooling Heatsink Bracket for Graphics video card, this is the route that i was going, but my problem is i cant control the fan with the GPU, but your card is not the same as mine so only you can test it. If you cant use AMD software to control the fans (whichever 120s, or the artic) then what i suggest is the adapter on my previous post and just connect it to the you fan controller. Now im not saying to go one way or the other, im just giving you options, all are different and the outcome will be different also, so its up to you to decide what suits you better. Personally i gave up to the 7V included addapter, its quiet enough, and believe or not the Arctic Cooling is such a good cooler that my card never passes 60C even under heavy load and its very quiet still, so after all that testing, i just let it be. I'm afraid I have gotten rid of the original gfx cooler, so I'm not sure how I would check wether the video card can run the cooler fans automatically or not. They are 3 pin as you can see. Are you still insisting that they will fit? Hope the following helps, the only thing that idk for sure is why there are blue and white connectors on the controller, not sure if there is a difference, but check the manual to see if there is anything. 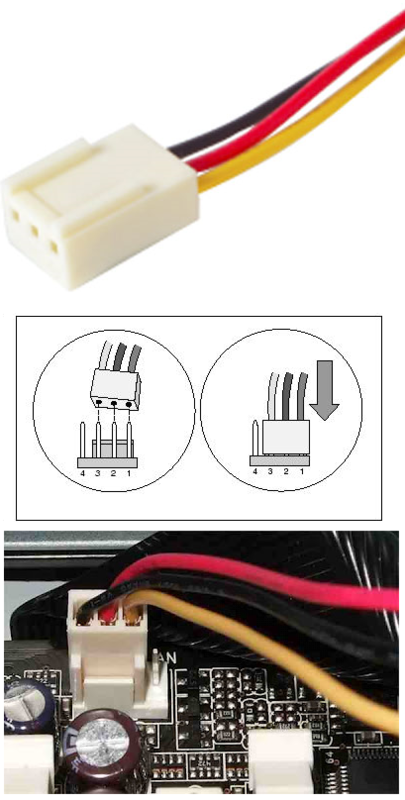 The indentation of the male 4pin (that matches 3 cables) should match to a flap on the female connector on the fan controller, its a very small platic flap that guides the orientation and the position of the right way of connecting the header. Last edited by Abula on Sun Dec 01, 2013 1:26 am, edited 2 times in total. All this is both interesting and fun and at the same time pretty daunting for someone as clueless about computers as I am. I appreciate the help alot, though. And I apologize for being slow to catch on. If I'm supposed to connect three of the four pins to a three pin connector, isn't there a risk that the one pin I'm supposed to leave out is one of the middle ones? You have three cables coming from the fans. From the pictures you provided we can see that they are red, black and green. Red is plus and black is minus (the green is the RPM signal and only useful if you like to monitor RPM). 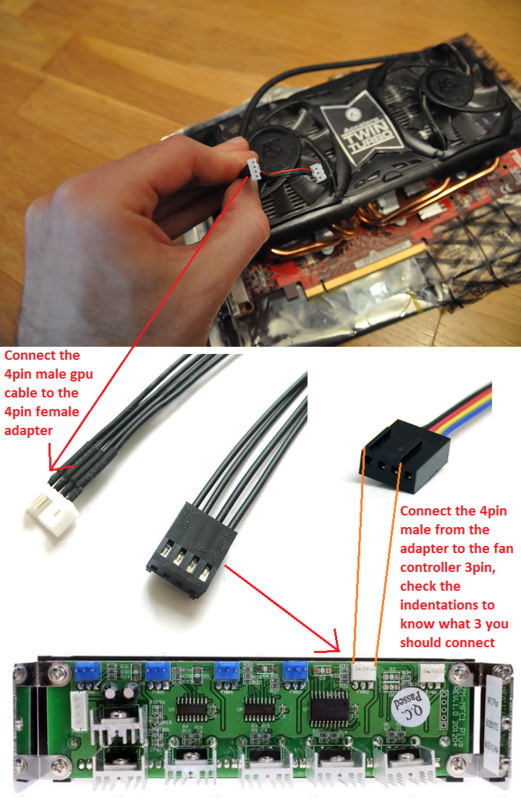 A standard 3 pin fan has the same three cables (but the colors might be different). So it's quite easy really, in theory. You just need to make sure the right cable gets to the right place. Maybe it would be more simple to replace the fans. That is remove the two small fans, forget about the wires, get a 120mm fan with a normal 3 pin connector, zip tie it to the heatsink (buntbanda ihop till en enhet som vi säger ;) and connect the fan to your fan controller. So, from left to right: blue, green, red, black. So the one that's "left behind" is the blue cable, just as Abula said was typically the case above. Anyway, I think I'm starting to make sense of it all. As a swede, do you know if an adapter of the kind Abula links to above is available for purchase here? It seems more practical to buy it here than to have one shipped from across the other side of the globe. Anyway, I think I'm gonna give this a try and if I don't get it to work I suppose the next best thing is to downgrade to a 6450 video card. At least that way, it will be silent, if significantly less powerful. By the way, Abula, as for the difference between the blue and the white connectors on the fan controller, if I understand it correctly, the white connectors make it possible to monitor the fan speed, with the right cable. The red n black are current and ground, the green is the rpm signal and the blue is the pwm signal. In the cables i posted is similar just the green in your is the yellow most commonly used on all fans for the color that represents the rpm signal cable. As a swede, do you know if an adapter of the kind Abula links to above is available for purchase here? It seems more practical to buy it here than to have one shipped from across the other side of the globe. 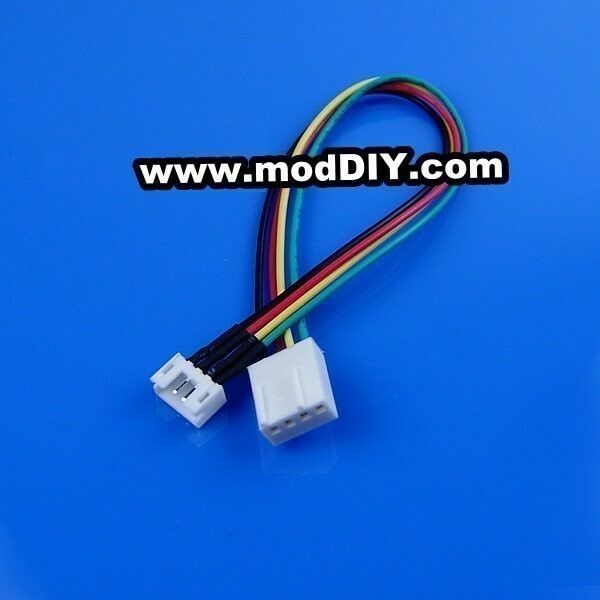 I wasnt not able to find one in the US, i had some people that could custom do me a cable, even i could do one, really not that hard as long as you can find a female GPU 4pin connector..... but i was not in a hurry at the time, had a big order in MODDYI, great place for a lot of things, even though is HK, they ship worldwide and pretty decent pricing. Either way im sorry cant help you into a local store in sweden, this kinda cables almost have no demand, is just for people like you n me that their custom cooler didnt work out and we have to do something about it. Ok then connect the 4pin to the white connectors so you can see the rpms if thats important to you, imo it is so you can see if its spinning as you probably going to drive it to inaudible levels. I just put in an order. I actually ordered both of the cables you linked to. I figured I might as well, it's not like they cost a fortune anyway. Now I keep my fingers crossed. Waiting for the package to arrive I'll probably look at a new PSU. Mine has gotten pretty noisy.